For anyone that is not familiar with the acronym PIES, it stand for the areas of development. P=Physical, I=Intellectual, E=Emotional and S=Social. Just as addition,subtraction, multiplication and division are the foundation for math and the alphabet is the foundation for reading, the PIES are the framework for child development. A child’s development is like pieces of a jigsaw puzzle…each piece is important to the whole puzzle just as each area of development is important to the whole child. When talking about the development of children, it is difficult to discuss the concepts that relate to the whole child without knowledge of the basics. Knowing the PIES helps students to understand the various ways that children grow and develop. Pass out individual oatmeal “pies” to everyone and tell them our topic today deals with pies; the developmental PIES. 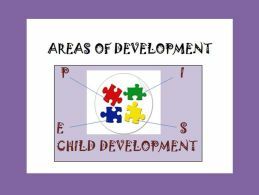 Pose the question via the PPT “How is a child’s development like a jigsaw puzzle? Field responses, looking for the idea that there are individual parts that make up a puzzle but each contributes to the whole puzzle. Use the PPT to present and discuss the notes relating to each area of the PIES. Students will fill in the PIES notes sheet. After taking notes, students will practice categorizing examples into the correct areas of development. I do this by printing out the examples on card stock, cutting them apart and then putting a piece of magnetic tape on the back of each one. I draw a large quadrant on my magnetic chalkboard and label each section with a letter of the PIES. Randomly pass out slips and students must take their slip to the board and place it in the correct quadrant. After placements have been made we evaluate them as a group, discussing any that seem like they don’t belong and move to correct quadrants if necessary. I like to have students practice a little more by drawing a quadrant on the back of their notes sheet and labeling with the PIES. I then show them the below YouTube clip and have them write down examples of the PIES being represented in this clip. Students then share their examples, with partners first and then as a whole class. Finally, students can eat their oatmeal pies as they wait for the bell to ring. Go back to the PPT and as a bell ringer, have students read through the case study and identify the PIES taking place. Check the key for accuracy. Now for the assessment, there are multiple ways that I have done this. Feel free to choose what works best for you. Option #1: Students will write a scenario based on a randomly selected setting. The scenario should incorporate all of the areas of development: physical, intellectual, emotional, and social. It should also include a “key” identifying the PIES used. This may be neatly hand-written or typed. I then have students swap scenarios and answer the PIES relating to the scenario they now have. This way they get a grade for writing one and answering one. See attachment below for the list of scenarios. Option #2: Students will create a Developmental Areas Mini-Poster by finding a picture of a child or children in an interactive situation with another person, preferably an adult or older sibling. Glue picture to the center of the poster. In the four corners, explain how each area of development is represented in this activity. Posters should be neat, creative and thorough in explanations. Be prepared to share and explain to the class. Hang around the room when finished. Option #3: Project the assignment “Picture Analysis” on the screen and have students complete the writing assignment as per the instructions below the picture. In addition, I have student also complete the quiz “The Developmental Building Blocks” as part of their grade. Note: With some of these options, you may have to review the concept of inference, something students should already be familiar with from English class. Here are a couple of good review activities from TPT: Making Inferences Sample and Inference Skills Through Comics. Sure…I emailed it to you. Thank you for sharing! Absolutely love this lesson! Kim, Great minds think alike! I have changed to a high school and was going to pass out oatmeal cream pies when I started this unit. I was just checking stuff out on the internet to supplement what I have and BAM! Someone else had the same idea and it was you! This is such a great resource!!!!! I found this lesson at the end of last school year, and finally got to try it out today-I LOVED it, and so did the kids. Thank you!! I downloaded all of this today. I can't wait to use it with my middle school students. Very interactive! Excellent lesson on the Areas of Development. I am going to use it in Occupational Child Care as a great review over all the area of Dev.. For some reason, the PPT is not downloading for me. Is there anyway you can send it to me?